Bardia one of the districts in Nepal with almost an area of 2025 sqm km has been satisfied with various cultures and influence historical stories where it offers a perfect opportunity for travelers. Bardia is recognized highly in an agricultural field which stores tons of food yearly and is the main incomes resources for Bardia residents. Apart from this people are involved in private or Government jobs, small to medium businesses. The Longest River of Nepal, Karnali follows through the Bardia and been divided into the villages for an irrigation their fields. According to the history, Thaur’s are the first settlement in the lowland Terai region and best known who eradicated the Malaria. Let’s go what you should not miss while you are in Bardia, Western Nepal. 1) Bardia National Park: This is one of the main attraction in Bardia and has spread over 968 Esq km, which offers you Jungle Walk, Bird Watching, Wildlife Rafting, Jeep Safari, Fishing in Karnali & Babai River, Camping inside the park, Elephant Safari or even canoe ride. The park records over 500 species of mammals, over 400 species of Birdlife, and more than 120 fish species. Apparently, this park is most popular for Tiger, Rhino and elephant included 5 different types of Deer, two types of Crocodiles, two types of Monkeys. 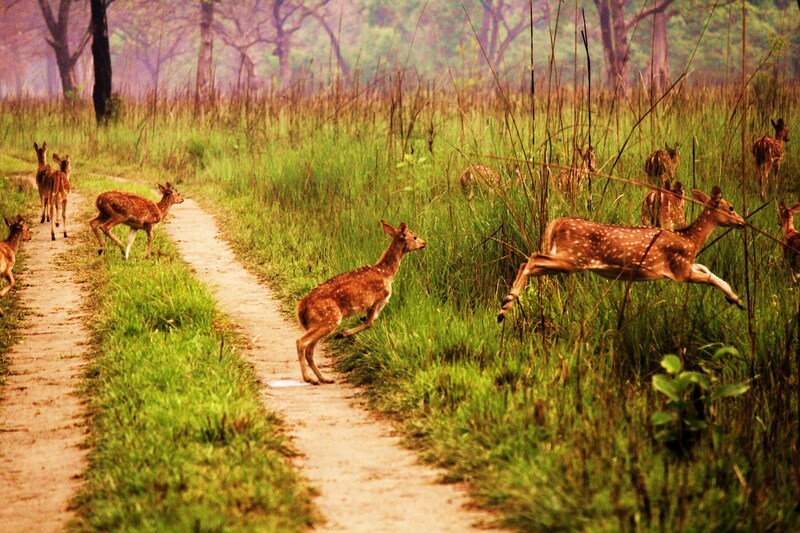 2) Black Buck Sanctuary: The another most second attractive spots in Bardia is the visit to Black Buck Sanctuary which is located in Khairapur almost 40 km south- east of Headquarter of Bardia National Park or say easily from Thakurdwara Village. This is only the place where the Black Buck are located in Nepal, and according to Hinduism Black Buck are taken as a symbol of God Kale Krishna according to its color matching. If you would like to have a push bike adventurous, it will take around one hour to reach or even you can do the bike ride or public transportation but hoteliers or homestay can organize you the private transport. One should not miss this place, especially if you are lucky just see how Blck Buck jumps in the sky. 3) Thakurbaba Temple: This temple is positioned in the heart of Thakurdwara Village, a 10-minute walk from the headquarter of Bardia National Park. Usually, it opens every day for followers but on the occasion thousand of visitors visits this temple. Especially in mid-January or the first month of Magh according to Nepali calendar, Thousand of visitors can be seen who comes to worship Thakurbaba God or we Say God Bishnu, Followers start to take a bath in a very cold water river from 12 AM and stand in a queue and fasting hoping to fulfill their desire. Many stalls are set up which last for almost three days for their easy convenience. I will get back to you with the history how it happens. 4) Karnali Bridge Chisapani: Karnali Bridge a connection between Western and Far-Western Nepal is sitting on top of the Karnali River in Chisapani. You can enjoy the view standing on the bridge where you can feel the coolest air all the time day or night. The bridge has been designed in the cable-stayed style which adds up more attractions where 3870 tons of stainless steel has been used and contains 500 meters in length and 10-meter width.